Today was apparently my day of endless errands... I was in and out of the house most of the day trying to get all of the tasks crossed off my list. I knew it was going to busy today, but I didn't think it was going to be all day! With that, I had a feeling I wasn't going to be up to making any long or time intensive recipes for dinner. Thankfully, there are plenty of recipes that can be on the table in a snap - just like this Corn-Tortilla and Egg Scramble (aka hot mess on a plate) I went with tonight! Using several corn tortillas, hand torn into bite-sized pieces, start us off by crisping them up in a generous, but not excessive, layer of canola oil. 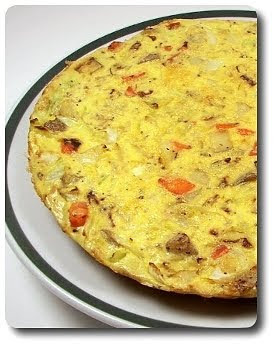 Use a large skillet for this, allowing you maximum room to spread the tortillas out as much as possible. Toss them about often, as much as needed for even color, and as soon as they become crisp, scoop them out onto a paper-towel lined plate to dry. Be sure to use a slotted spoon so the oil drips through, rather than sloshing it about as you move the bits out. You won't need all of the oil left behind for the rest of the dish, but you will need some - about two to three teaspoon is enough. The rest of the oil does get discarded - you could try and use less so there is not as much waste, but the tortillas may not come out as well. Chopped onion, along with a diced poblano chile, cook in the reserved oil until they have both begun to soften their raw bite. Chunky cubes of tomato join the mix and as soon as its juices leech out and the flesh breaks down, the rest of the ingredients are added and you'll be eating in no time! What we added was a combo of whole eggs and egg whites (you could use entirely whole eggs if you wish - eight would be the amount), the plethora of tortillas and a couple ounces of sharp white cheddar. It will only take a couple of minutes for the eggs to turn into luscious curds and the cheese to melt, binding everything together. I'm sure some will ask "But, won't all those tortillas turn soggy?". Yes, kind of - that's the point, to soften them. However, crisping them first not only adds flavor, but it allows them to not fall apart and turn to mush. Feel free to drop a few spoonfuls of salsa over the top or a couple dollops of chipotle sour cream, but Jeff and I both decided to haul out the bottle of Frank's and dribble several drops of the zesty juice all over. While I'm definitely no expert on Mexican food, I'm going to guess this is Everyday Food's take on Migas - call it what you will, we're too busy making sure we have enough ingredients to make this again for breakfast this weekend! 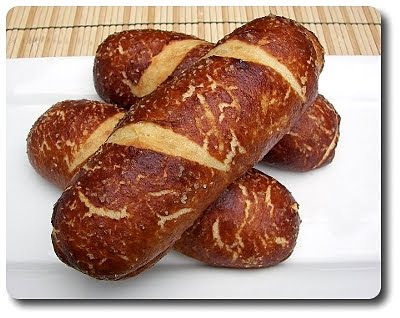 Some time ago, a reader e-mailed me a recipe she had been working on for Pretzel Bread. When Jeff saw this, his eyes lit up and asked if we'd be able to make it. I told him yes, but it fell by the wayside as time went by and after recently finding it again, I knew I had to give it a try and not forget about it this time. The only "fancy" ingredient you'll need for the recipe is barley malt syrup - this not-too-sweet mixture is made from sprouted barley that has been roasted and slowly cooked down until it becomes thick, dark colored syrup. It is just about half as sweet as regular sugar, yet doesn't have an unusual after taste and is pretty mild - meaning it can meander easily into several recipes with its subtle presence. Why use it in pretzels? Besides not giving much sweetness, it gives bread a rich depth of color. If you don't want to buy this (the syrup can be pricey), you can still make the bread - just swap out honey or brown sugar, though it may lack that authentic attitude. I used nonfat dry milk and water in the bread dough, but use milk if you like - this is just what I typically have on hand. You can also prepare the dough in a bread machine or a stand mixer if you like, but I love using my hands to knead dough - just try not to add too much excess flour while working it. By the time you are done kneading (using whichever method), you are looking for it to be supple, soft in texture (but firm to the touch) and have a bare tackiness to it. 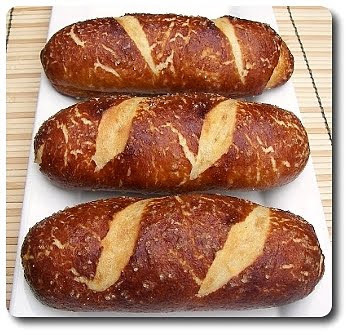 Shape the bread how you like - make a rustic big pretzel boule, buns or knots for a wicked sandwich roll or do what we did - slender torpedo loaves, along with bite-sized nuggets! 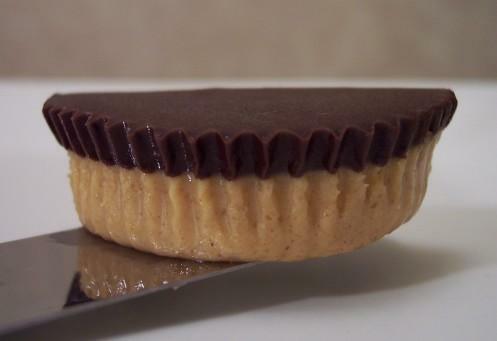 The reader who sent me the recipe, J., also suggested you could try to line a strip of dough (about 1 1/2" wide by 12" long) with peanut butter, then seal the dough into a tube and slice into small bites for a sweet and salty treat. If you do that, you may need to stiffen the peanut butter as I imagine using the nut butter alone, it may want to absorb into the bread as it bakes, rather than leaving a generous peanut bomb inside. As usual with most types of soft pretzels, after being shaped and rested, the loaves and nuggets were dropped in a baking soda bath, then patted dry, brushed with an egg wash, salted generously and then baked. I used a baking stone for both the loaves and nuggets to get the best burst of heat to the dough - again, this doesn't mean you can't make the recipe without use. Just be sure to give the oven plenty of time to heat up and bake them on a parchment-lined sheet pan. I tried to stave off Jeff, but he tore into one of the loaves as soon as it was cool enough for his fingers to do so, without leaving welts behind. They were everything he had hope for - a robust pretzel taste, with a captivating "fluffy" texture that crossed the line between a soft and a hearty chew. If you intend to store these at room temperature for more than a day, do note that the salt on top will start drawing out moisture and make the top a bit damp - I suggest freezing them if you won't finish the loaves or nuggets quick enough. We've been asked a few times if we're still keeping up with our weekly Friday Night Pizza. Yes, absolutely! However, they just haven't been new recipes - Jeff has been going down the extraordinary large list of pizzas we've already made and picking out favorites to make again. Tonight we're planning to make that Roasted Garlic Pizza we first made in '08! Instead of just rambling about that, let's get to a new dish we made! Remember that giant bag of farro we bought at Costco several months ago? Well, we finally worked our way down to the bottom of the bag and used the last cupful of it to make this Savory Farro Tart we had for dinner recently. Depending on the kind of farro you use, you'll need to adjust the initial cook time for this nutritious grain. If using "semi-pearled", which is what we bought, it should only take roughly 15 minutes to become tender. "Whole" farro (with the hull retained) will take closer to 45. As I mentioned in the post I linked to, we've only come across the first variety, but you may want to double check what you have just so there are no surprises! A mess of ricotta becomes the base to this tart, spiked with garlic-y melted butter, the cooked-to-tender nutty farro, a couple rich egg yolks and a whole egg, Parmigiano-Reggiano, smoked mozzarella, parsley, fresh grated nutmeg and crushed red pepper. The original recipe didn't have any smoked mozzarella in it, but we had a cube left in the refrigerator from another recipe and thought it might work out well here - it did! 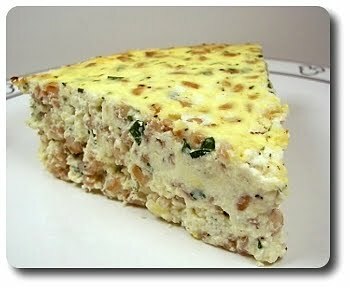 If you'd like to add a bit more color to the tart, I bet adding a bit of spinach would work well, especially with the nutmeg - you could either use fresh and quickly wilt it down in the farro cooking liquid, or go the easy route and use thawed frozen spinach, with any excess liquid thoroughly squeezed out. There isn't a traditional pastry crust, but to give the outside a little boost (and help with release! ), the pie plate is buttered and coated with a spoonful or two of fine dry breadcrumbs before the enlivened ricotta is smoothed into place. Stashed in the oven to bake, you'll want to let this go until the center just barely feels set and the top has taken a pale golden hue. This tart does need to cool before you dish it out - it won't have to cool completely, but it may be hard to get out slices if you serve it pipping hot. We let it rest until it was warm to the touch - this took about 15 or 20 minutes. Kind of like a savory cheesecake, studded with pearls of chewy farro, we found this creamy tart to be quite hearty at six servings - there was definitely a wash of comfort that came over us as this filled up our bellies. Since this has a very open profile, don't be shy with playing around with the cheeses and fresh herbs - parsley was nice, but think about combining it with basil or fresh thyme for variety. It's time for another one of those "let's get a few of those darn recipes wrapped up and posted before you forget about them!" Honestly? I have an ever-growing list that sits next to me, mumbling every so often that I'm not paying attention to it, of 26 recipes (as of today) that we've prepared in the past, say, three months. Days have just been passing by so quickly as of late that before I know it, the sky has darkened, my eyes are droopy and the ambition I had to check another recipe off that list has vanished like the food that was just on my plate. Soon enough I'm sure this will change, and until then, we'll just do our best to do what we can! I think we'll start off with a hearty casserole we dived into just before Jeff had his surgery. I do want to say I don't think this Buffalo Chicken Casserole will be for everyone and you may want to tweak it for your liking. 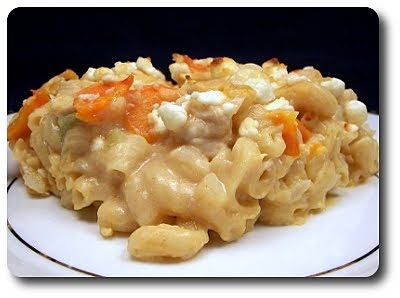 We stayed close to the recipe, though we added a bit more cheese and ended up having to use crumbled goat cheese. Blue cheese is what was called for and would definitely add that pungent bite one expects with buffalo chicken - however, when I asked Jeff to grab it at the market, he snagged goat cheese "by mistake" (or so he says... he just doesn't like to believe he enjoys blue cheese. I call sabotage!). I didn't know this until it was too late - the cheese we ended up using turned out fine as its own tang worked well, but you could tell it seemed a bit out of place. As for other adjustments to think about, I have some ideas to share. Using the amount of pasta called for, the dish was pretty tight and very noodle-y in proportion to the rest of the ingredients. Neither of us minded that, but you may want to bump that down to 10 or even 8 ounces for a more creamy casserole. 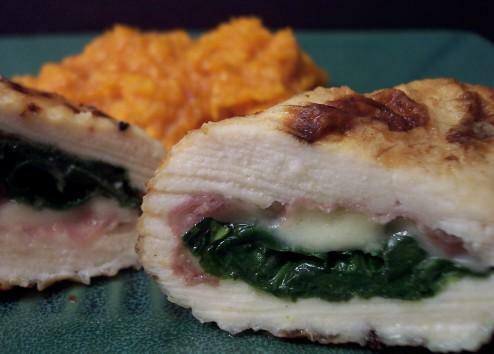 We used all chicken breasts for the protein, but for a more meaty richness, swap half of the amount for chicken thighs. Finally, five tablespoons of hot sauce (and of course, we are a slave to Frank's RedHot - I'd definitely recommend it for this) seemed skimpy for an entire pan of this, which thankfully we thought of beforehand and tossed in an extra three tablespoons for good measure. Before we got involved in all the holiday baking, Jeff asked if I could find a snack-y type of cake to make. Some variety of moist banana cake came to mind first, but after searching through the freezer to find we had no ripe bananas already stashed away. With no patience to wait for the green-tinged bananas on the the counter to ripen, I had to go in another direction and went with this lighter Sour Cream Coffee Cake. Calling for all pantry-staple ingredients for us, this choice was a no-brainer... mainly because I really didn't feel like going to the market. 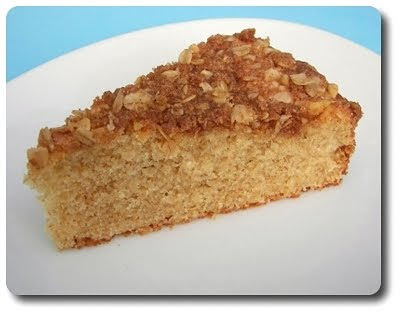 Moist, with a slight residual tang from the cupful of sour cream, this cake takes a healthier route by cutting some of the all-purpose white flour with whole-wheat pastry flour and toasted oats that we ground to a floury texture. We used a food processor for this, but a blender may work ok - I'd also use a spice grinder, cleaned by blitzing with either rice or a bit of bread for no lingering impurities left behind. Once the batter slides into the pan (springform for easy removal), the top of the golden mixture is sprinkled with a sweet smashed concoction of toasted oats, brown sugar, toasted walnuts, cinnamon and a bit of butter. 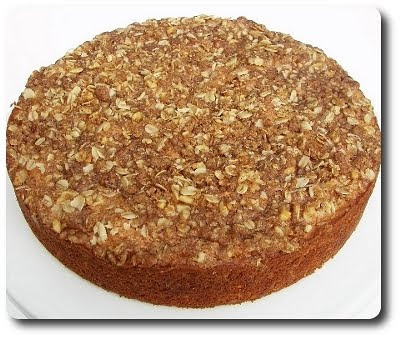 We had this first while it was still radiating warmth and found it moist and tender, with a delicate crumb that's still soft after including the diverse grains. We took off wedges for a good two and a half days until there was nary a crumb left on the cake stand - it was surprisingly just as good as that first slice, if a touch drier, by the time we finished it! We'll follow up the above chicken recipe with, you guessed it, another chicken dish we had the week before - this Cashew Chicken! 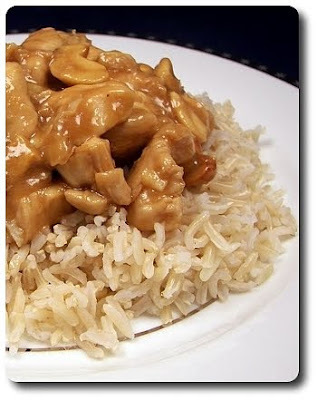 Chopped into bite-sized chunks, the chicken was given a snazzy bath in a combination of dry sherry, fresh ginger and a sprinkling of cornstarch. Given a good thirty minute rest, the chicken cooks in two batches to give each nugget time and room to attain a deeply caramelized color on the outside. With both batches done and scooped out, a drizzle of oil heats up to take the rawness out of a few garlic cloves and lofty handful of cashews (plus the whites of a scallion if you have them - more on that later). The sauce, made from broth, soy sauce, rice vinegar, sugar and a scoop more cornstarch to thicken, joined the garlic-y mix, along with the golden chicken cubes. The sauces thickens in a flash, clinging to the chicken well with a slick coating. We served this over a bed of brown basmati rice, cooked using the no-fuss method we've come to use every time we need it. Jeff did mention he'd like a sprinkling of crushed red pepper after his first forkful - I obliged for his portion, but I was content with how it was. I did think a few extra vegetables would have been nice to round this out - maybe chopped broccoli or sugar snap peas? If you go that route, I'd probably make one and a half times the sauce to allow for enough coverage. We didn't have the scallions called for (they were very wimpy and slick in the market, so we passed) - however, I left them in the recipe text and would recommend using them. I have another recipe to share where we used the bounty of fresh North Carolina blueberries we were able to pick up from the market several weeks ago (I know, I'm saying that a lot recently... I'm working on a backlog of recipes!). We ended up with two grossly large pales, half of which were tossed in the freezer for smoothies, pancakes, muffins and to toss in yogurt, while the rest we used used in recipes or inhaled by the half-pint. 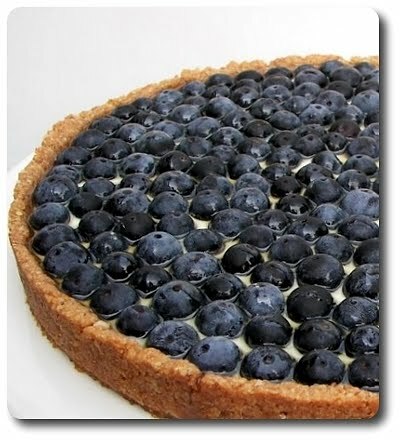 We actually made this Blueberry Tart with Walnut Crust shortly after we finished those intriguing mashed-potato laced Blueberry Cupcakes. 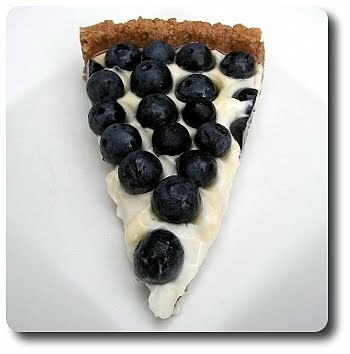 What caught my eye about this recipe, besides the blueberries, was the crust - graham cracker crumbs (we used cinnamon, but honey would be lovely) gave us a base to work with, but what made it pulse with vivacious energy was the handful of lightly toasted walnuts ground down with the crumbs. 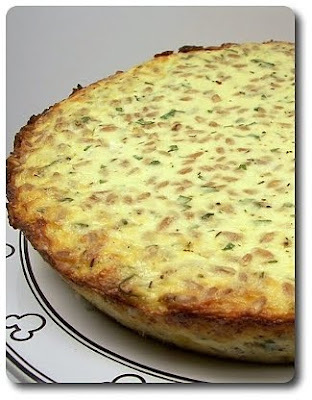 For a slightly lighter base, instead of several tablespoons of melted butter to bind the crust together, this recipe called for just a single tablespoon each of butter and canola oil, along with a large egg white to tighten the crust into a cohesive foundation. The only baking that happens with the tart is the crust - after being mashed over the bottom and up the sides of a removable-bottom tart pan (easy access once complete! 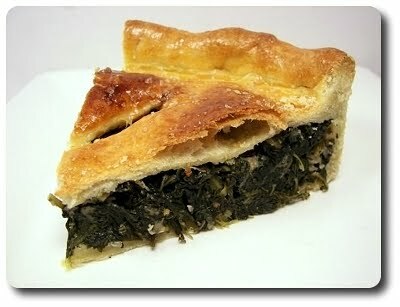 ), it needs to bake for a few minutes to set the crust. 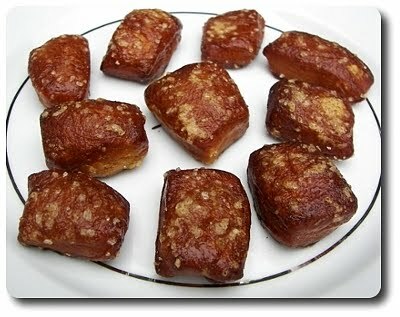 It will smell exceptionally nutty, darken slightly around the edges and the center could be dry to the touch when done. 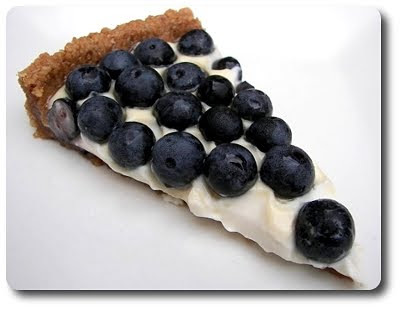 To finish out the tart, the filling is made by whipping together cream cheese and tangy sour cream with enough pure maple syrup to give the creamy mass with a robust sweetness without taking the the shining star off the fresh berries. When you spread this creamy fusion on the cooled crust, try not to be too overzealous - while I wouldn't call it brittle, it is fairy delicate. With the plump orbs artfully (or just scattered... don't get caught up in perfection!) arranged on the buoyant? 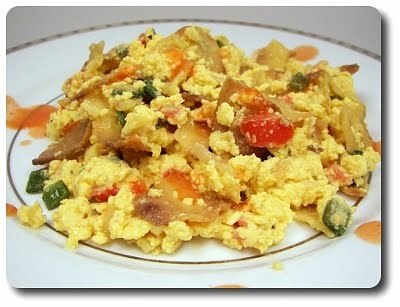 filling, a couple extra tablespoons of maple syrup were drizzled over for a smashing glimmer on top?. Let this set for at least an hour before you slice and serve - the filling firms up enough that you can pull out slices without much oozing, but is still more soft set than firm like a cheesecake would be. While going through pictures to get ready for the post, Jeff walked in and he immediately requested that this be the first treat we make as soon as we can get our hands on fresh blueberries this year - I think that's a good call! Even though there is more snow on the ground now (ugh... what happened to "It doesn't snow in North Carolina! "), and there is plenty of cold weather ahead of us, I'm constantly going over in my head how we are going to work a garden into our backyard. We have a fairly giant tree smack dab in the middle, which soaks up a good portion of the warm rays from the sun (which is evident by the barren grass underneath)... but we've found sections that still steal enough for greens to flourish. We are talking about having someone come out to trim the mammoth in the spring, but we'll wait and see how our plans develop. While we are debating what exactly we will try and plant, I know two items that will definitely be there - a mass of kale and Swiss chard. It may have taken us years to sink our teeth into these two vegetables (like many other foods), but we have grown to love them quite a bit. When they were still abundant at the end of the fall season, we had intended to pick up a couple bundles of Swiss chard for a recipe, but we came upon a vendor who had several steamer-like trunks set up, each overflowing with piles and piles of dark jade-colored kale. The farmer behind the table was glowing with her bounty as this was her last trip and this, as she said, was her best haul of the year. 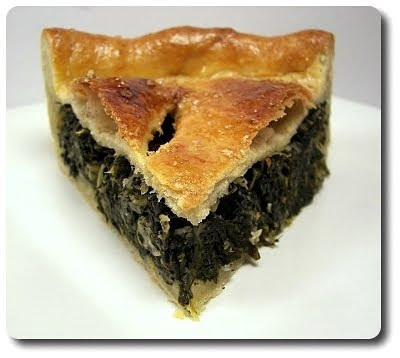 While she was bursting with ideas on how to use it, mainly different juices she's been making, I already had a plan in mind... this Double-Crusted Kale Pie. Instead of a traditional pie crust, this recipe uses extra-virgin olive oil for the fat. And before you ask, no you will not get the shatteringly flaky layers as if you used lard or butter. However, for this pie, neither of us thought that was a bad thing. The extra sturdiness was very welcomed and the delicate fruity background of the oil added a pleasant zing. The oil also made this four-ingredient dough extremely easy to work with - no tearing, no sticking and it doesn't have to stay cold. The filling is a mixture of softened onion, plenty of robust garlic cloves, crushed red pepper for a snappy bite, Parmesan cheese, flour to keep the moisture controlled, lemon zest and juice, along with the large pile of vivid kale we picked at the market. We didn't just make use of only the leaves either - the thicker stems are used too - they are simply diced and added to the pan for a couple minutes before the leaves joined the mix. If you have a scale handy (which I highly recommend! ), dividing the dough for the two crusts is a breeze. Not that you can't do it by eye, but you're using two-thirds of the dough for the bottom, while you need the other third for the top - it won't be an even slice down the middle. The larger half is fit snugly into a round cake pan, with the filling scooped in, then the other piece of dough is gingerly draped over the top. With the two edges of the doughs pressed together ala an apple pie, instead of folding the crust backwards, we tucked it in forward for a rounded thick edge. 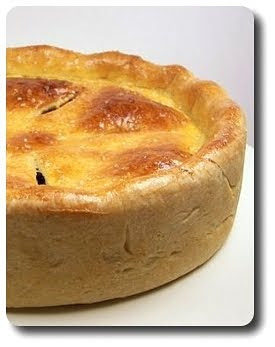 With a few vents sliced through the top, a good brushing with an egg wash and a light sprinkling of salt (versus sugar! 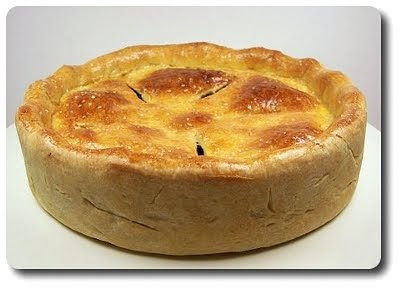 ), the whole package goes into a hot oven to bake until the filling is pipping hot and the crust is deeply golden. Do allow several minutes for this to rest before you even think about slicing into it - this way you'll be able to pull out slices without juices running out from the filling. Savory, veggie-friendly and pretty impressive to look at (especially unmolded and placed on a decorative platter or stand), if you have extra time one day on the weekend and would like to bang this out for dinner during a hectic weeknight, you can prepare and assemble this entirely up to the point before you place it into the oven. Instead of baking, place the full baking pan into the freezer, unwrapped, and let freeze until just firm, about 1 hour. Wrap it in plastic wrap, then foil, and store in the freezer for up to a couple months - bake from frozen and increase the baking time to one and a half hours. Being left with half a head of cabbage after using it to make that Shepard's Pie, I went looking to figure out a way to use it before we had to toss it. Neither of us are giant fans of it (though, I am warming up to it), so it was going to have to be somewhat masked for it to pass muster with Jeff. 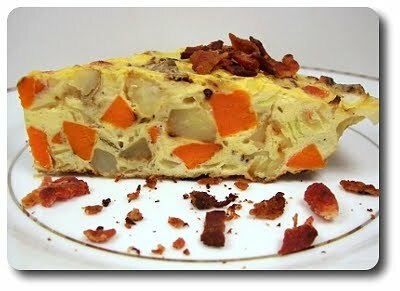 I didn't have a ton to look through in un-tried files, but I did come across this Cabbage-and-Potato Frittata with Bacon! Potatoes and Bacon huh? Sounds like a smashing way to wiggle that cabbage into Jeff's belly without getting "The Look"! With the bacon up first, the strips were cooked in one of our large skillets until crisp - I like to start them off in a cold skillet, then turn the heat up just to medium. Too quick of a heat and the texture never seems right - slower seems to work better rendering out the fat for crispy slices. With three tablespoons of that aggressive fat left behind, we used it to cook half-inch cubed potatoes and carrots until the two began to soften and barely take on a golden color. The thin shreds of cabbage jumped into the mix, along with a scoop of chopped onion to cook down. While the recipe called for whole eggs, we had a bowl of whites hanging around in the refrigerator (I had used the yolks yesterday for another dish) that I needed to use or freeze - we ended up using seven eggs and six egg whites. If you'd rather not worry about the whites, drop them out and add three more eggs. Whisked together with a hit of salt and fresh ground black pepper, be sure to stir the eggs into the vegetables as you pour them into the skillet - this helps keep everything evenly distributed, rather than if you have just dumped the whole lot in the middle. Since there are a lot of eggs involved here, to get this frittata cooked through, without having to think about hot spots, leave the skillet over the heat long enough to barely set the edges. When you see that, slide the pan into the oven and let the even heat inside do its job to gently finish off the still-runny center. 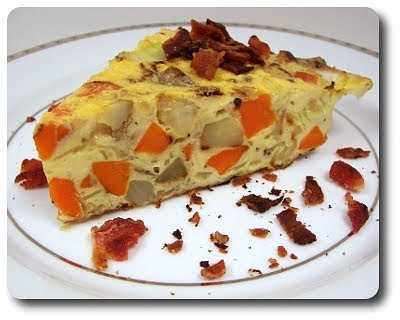 Usually you'd find some sort of cheesy addition in a frittata, but with the crunchy bacon crumbles and tender vegetables inside, we found we didn't miss it at all. That doesn't mean you can't add any though - I bet a handful of creamy goat cheese crumbles (sprinkled on just before the pan went into the oven) would be a lovely addition. If you'd like a tang, without the use of cheese, drop dollops of sour cream on just before serving. I'd also suggest a sprinkling of thinly sliced green onion on top for a pop of color and freshness, but alas we forgot to pick up any at the market. Back in the middle of summer when the melons were not only abundant, but sweet and plenty juicy, we had picked up a cantaloupe at the farmers' market for the sole purpose of noshing on as a snack. For as good as it was, after a couple days of gorging on the orange flesh and seeing it not shrink that much in the refrigerator, I realized I'd better find another way to use some of it up before it started to go! 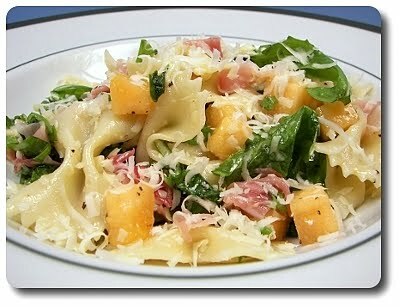 After a bit of digging around to see if I already had a recipe somewhere, this Prosciutto and Melon Pasta Salad dish popped up and Jeff immediately gave the green light. The dressing for this salad was a snap to make, created by simply whirling fresh lemon juice, tangy white wine vinegar, Dijon mustard, a clove of garlic and for a note of heat, cayenne pepper, in the processor bowl. With a few tablespoons of fruity extra-virgin olive oil gradually streamed, the dressing was finished in a flash! If you'd rather not dirty the processor, you could, of course, whisk this together in your favorite sturdy bowl. 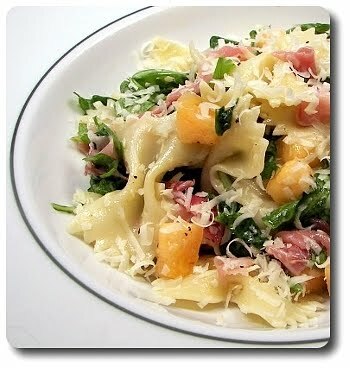 The bulk of this salad is made with cooked and cooled farfalle pasta, but to round out each serving, peppery arugula leaves, the above cantaloupe, diced, sliced shallots, mint and thin strips of salty prosciutto were added to the bowlful of bowties. With the distinct dressing drizzled over and the salad gently tossed together to coat, the last ingredient to lift this up came in the form of cheese - but don't use any ordinary Parmesan, treat yourself to a good hunk of sharp Parmigiano-Reggiano. Even if you don't think you would like the cayenne in this, I urge you to try leaving the bare amount called for in the dressing - the slight bite was not enough to put your mouth on fire in the slightest, rather it was there to light up the salad with a note of warmth. Jeff and I both thought this was a refreshing, unique and a bit more filling twist on the classic melon/prosicutto combo!